If you have never tried Beef Stroganoff, then this is the recipe for you! It is so easy to make in your Slow Cooker or in your Instant Pot! Now if you are working or have a busy day, I suggest throwing this in your slow cooker, but if you have time when you get home, I would HIGHLY suggest uSing the Instant Pot. It just makes the meat taste SO GOOD! Next add your garlic, mushroom, and onions and saute those also for 3 minutes. Put the lid on your Instant Pot and cook on Manual for 12 minutes. Do a quick release, add 16 ounces of Egg Noodles into your pot and add another 1/2 cup of beef broth. Close the lid and cook on Manual for 4 minutes. Do another quick release. Mix in 1/2 cup to 1 cup of sour cream and mix it in! If it is too runny, turn the saute button on and let it cook for a little longer! So, it is time to start this week off right with a delicious slow cooked (or Instant Pot Cooked) meal that takes only a couple of minutes to prep, but tastes like you spent lots of time in the kitchen! I made this for dinner and my husband raved about it all week- definitely a keeper! If you don’t like egg noodles, then you could easily use potatoes or rice! I personally like the egg noodles, but any of those options are delicious! Place the stew meat, salt, pepper, and onion in the slow cooker. Stir to distribute the seasonings and onion. In a small bowl, combine the garlic salt, Worcestershire sauce, beef broth and ketchup. Pour over the meat. Cover and cook for 7-9 hours on low or 4-5 hours on high. About 30 minutes before serving, combine the flour and apple juice in a small bowl, whisking vigorously to combine well. Pour the flour mixture into the slow cooker, whisking quickly to mix in the roux with the stew meat and juices and to avoid lumps. Stir in 1/2 cup sour cream right before serving. Serve over pasta, rice or baked potatoes. This also makes a great freezer meal! I store the leftovers in a freezer-safe container and then thaw in the refrigerator (usually takes about a day) and reheat over medium-low heat in a saucepan on the stove. Looks tasty! Just stumbled this! your recipes are always so yummy! We tried this tonight and it was so yummy and best of all really easy! Thanks for sharing! I was wondering can this also be made in the oven & cooked Low & Slow??? Sure! I think that it would work just fine! I made this tonight and was a winner! Definitely keeping this recipe, yummy and easy to make. Thank you for sharing your recipes! What is the serving size for this recipe? I have a family of 8 and think I might need to double, but don't want to overdo it. For a freezer meal, could you put all the ingredients in a freezer bag uncooked, freeze and then cook in the crock pot per the instructions after thawing? Could you freeze this prior to crock-potting it do you think? I am a member of a freezer meal swap group and I think this would be yum! We have only put this in the freezer after cooking. This should work freezing it before putting in the crock pot. Honestly we have never done it this way. But it is similar to other freezer meals. Am making up comfort food for a sick friend to have on hand ?. this was just perfect. I will definitely make this recipe again (and have added your site to my bookmarks!). So I'm sure this would totally change the recipe but we have a dairy intolerance in our family. Would it mess this up if we left out the sour cream? It shouldn't mess it up. May alter the taste slightly. We have always added sour cream. I have an allergy to yeast extract which is the same as MSG and is in most beef broths so I subbed it for organic vegetable broth and it turned out great. I'm going to serve over rice. I would love to know if anyone has tried freezing without cooking first. I am running out of time prepping meals for daughter's upcoming surgery and would love to toss this in bag and freeze!! My husband loves this recipe. I always add extra mushroom because that is his favorite part. I made this in a double batch and froze some for when my second baby was born in June and it reheated beautifully. The mushrooms didn't get rubbery? I can’t seem to find that cheat sheet. Hi Michelle. I just talked to Kristen about the cheat sheet. She should be adding it soon. Thanks so much for catching that. The video for the Instant Pot recipe does not follow the directions in the post. Step 1. does not indicate salt and pepper as you saute meat. Also say 1/2 t garlic or clove and the written says 1/4 t garlic salt. Thanks for converting.... and looking forward to making within the next few days. Hi! My beef ended up a little tougher than expected. My IP manual setting can change the pressure to low or high. I used high. Which one do you use? Perhaps I should have sauted for less time? TIA! Yummmm! Our third meal in our new Instant Pot was a huge and delicious success! My only deviation from the recipe was to use 8 oz of noodles instead of 16 oz (out of an abundance of caution regarding the max fill line in my pot and being unfamiliar with how to resolve problems). 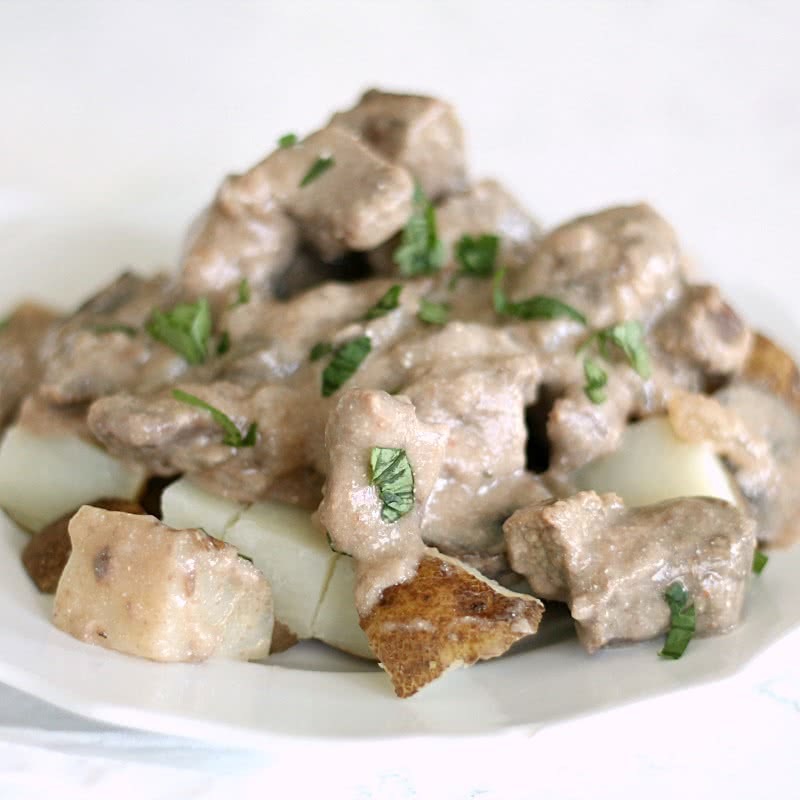 I have only made traditional stroganoff maybe once in 30 years of marriage, but this version will definitely be in our dinner rotation from this point. My husband really enjoyed it, and I can't wait to make it for our kids when they come for a meal!